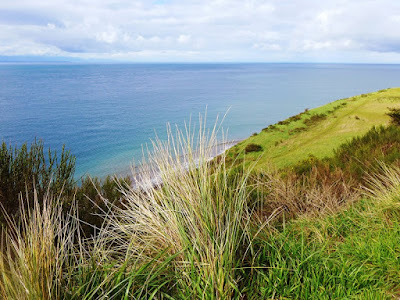 Last Wednesday we headed to beautiful Whidbey Island for a few days of escaping the city, and as usual, we went to Someday Farm Vegan B&B, which is located on 70 peaceful acres in the quiet town of Freeport. It's a charming and comfortable place to stay, and the breakfasts are exceptional. Whidbey Island is a short ferry ride from the mainland, and we've made it door to door in an hour — when the Universe aligns. Usually, we figure it will take us about 1-1/2 hours or less. The day we arrived, the weather was a little sketchy — windy, chilly and drizzly — so we opted to go shopping rather than hiking. When we go to Whidbey, hiking, thrifting and antiquing are our main occupations, and we have favorite shops in several of the small towns that dot the island. We made a good haul in the Freeland thrift shop, netting three items of baby clothing, a sweater for me and a children's book, for a grand total of $12. 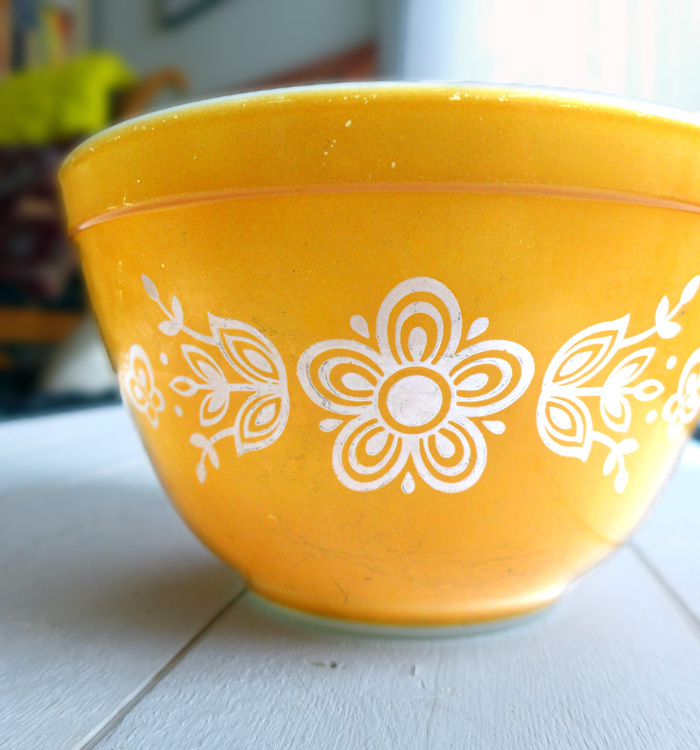 Next we visited our two favorite antique stores, and found a perfect little pyrex bowl that nests excellently into my other, similar bowls. After a long afternoon of bargain hunting and antique admiring, we stopped at a supermarket to purchase a cauliflower to add a vegetable to our dinner menu. Even though we had a full kitchen in the B&B, we didn't feel like cooking on this little trip. We brought along two packs of TastyBite Indian meals — channa masala and rice — and cooked the cauliflower to add in. 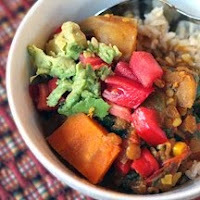 Easy vegan cooking. It worked for us. Breakfast (and lunch) on Thursday. The next morning, Jill brought us BREAKFAST — beans, rice, sweet potatoes, mango, plantains, avocado, chutney and muffins. Even two of us could barely eat half, so a good lunch was assured, though it would be well into the late afternoon before we felt hungry again. We needed all the good food to keep our energy up because we planned to spent much of the day hiking at Fort Ebey State Park in Coupeville. View from Bluff Trail in Fort Ebey State Park. We love the park — especially the spectacular views from the Bluff trail, high over Puget Sound. We spent a lot of time on the bluff, admiring the view over the water as well as the view in front of us, behind us and on both sides. 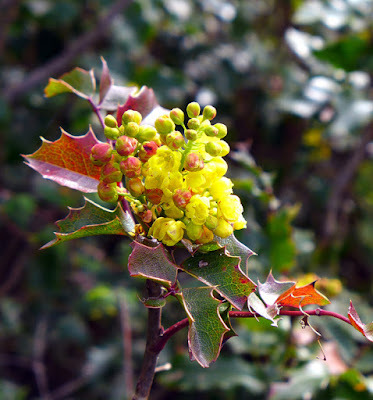 Oregon grape on Bluff Trail in Fort Ebey State Park. The Oregon Grape shrubs were in bloom, adding to the scenic experience. 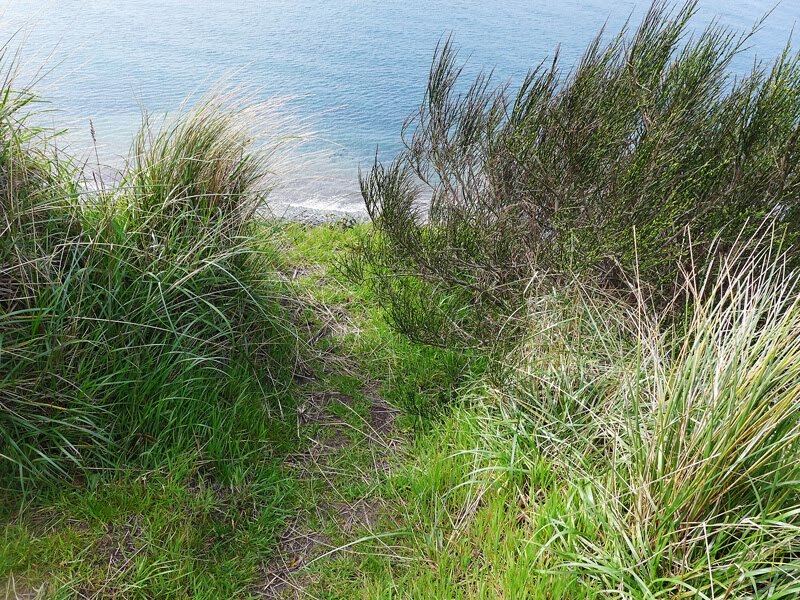 We also hiked interior trails, and spent time at the lake and at the beach. If you love a beach generously littered with interesting rocks and driftwood, this is the beach for you. I know you're not supposed to remove items from a state park, but the variety of amazing rocks is a big temptation. Yeah. When we finally got back to the B&B, we had a late lunch of leftovers, before venturing out again. Later, we were supposed to meet friends for dinner at an Asian restaurant recommended because although omni, it has clearly marked vegan menu options. My friend was sick, and couldn't meet us, so we opted to have a takeout dinner back in our cottage. I would say it was typical take-away fare, as in take away all the animal ingredients and serve the vegans whatever is left. It was okay, and I don't mean to complain, because I'm happy to be able to find vegan food on the island, but wouldn't it be great if a restaurant actually thought about flavor when creating a vegan dish? Although Jill has provided loads of videos, games and books, we were feeling the results of the long day, and were asleep by 9 p.m.
Breakfast (and lunch) on Friday. Ah, breakfast. 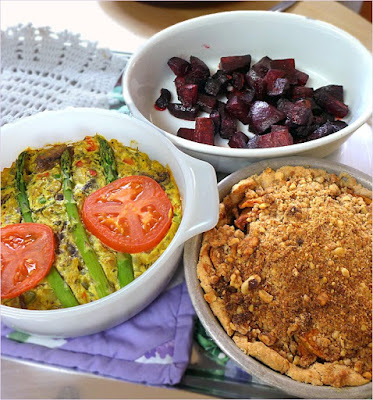 On our last day, the breakfast tray contained a tofu quiche with a rice crust, roasted beets and an apple pie. Jill offered me ice cream for the pie but I declined; it was breakfast, after all. We lingered over breakfast, then packed the leftovers into our new bowl (there was a reason why we needed the bowl!) We walked around the property, talked to the rescue goats, then headed to town to take a second look at a couple of items we were still thinking about from the day before. I tried to talk myself out of it, but we ended up buying a very cute kitchen scale that matches the color of our rear kitchen wall. It's not an antique — it just looks like one. We're slowly collecting items to display on top of the kitchen cupboards — you know, dust collectors — and it seemed so appropriate. As an item to display, I mean. Not a dust collector. 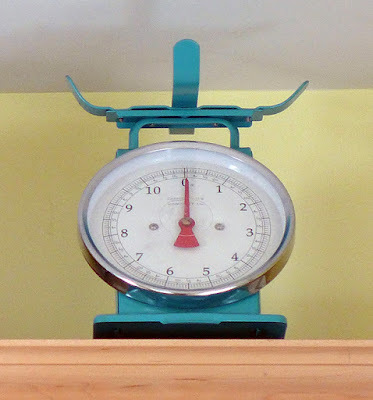 My new kitchen scale on display above the cabinets. The only bad part about going to Someday Farm is waking up back at home, and not having anyone knock on the door with a breakfast tray. 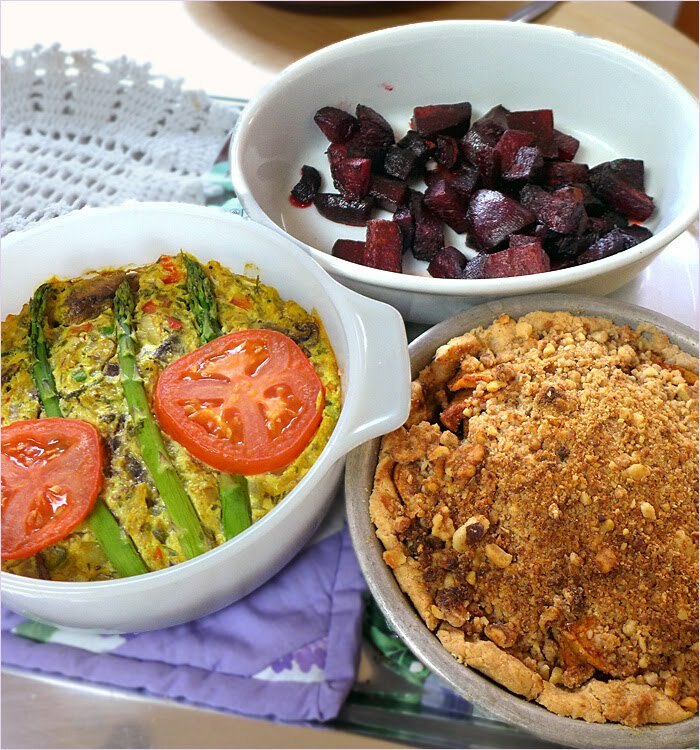 Do you have a favorite vegan B&B? 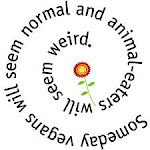 You can read my other posts about Someday Farm B&B here, and here. 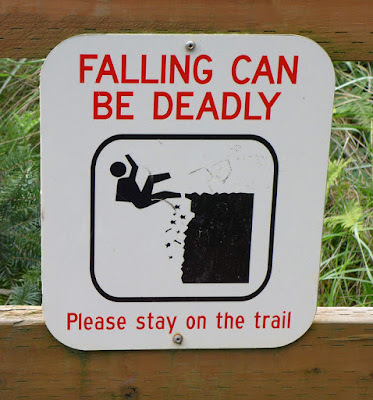 A sign on Bluff Trail. 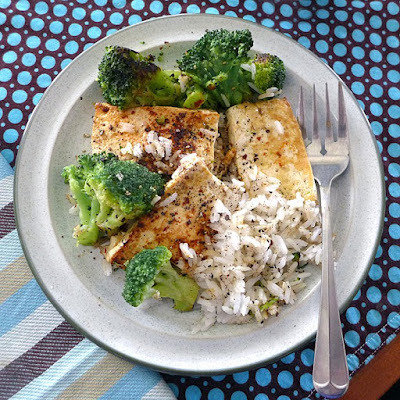 Not glamorous, but a tasty and filling lunch can be made from leftover rice, pan-grilled tofu, and frozen broccoli. Frozen broccoli isn't my favorite, but sometimes it's just what I need. There are days when even cutting up broccoli seems like too much effort. 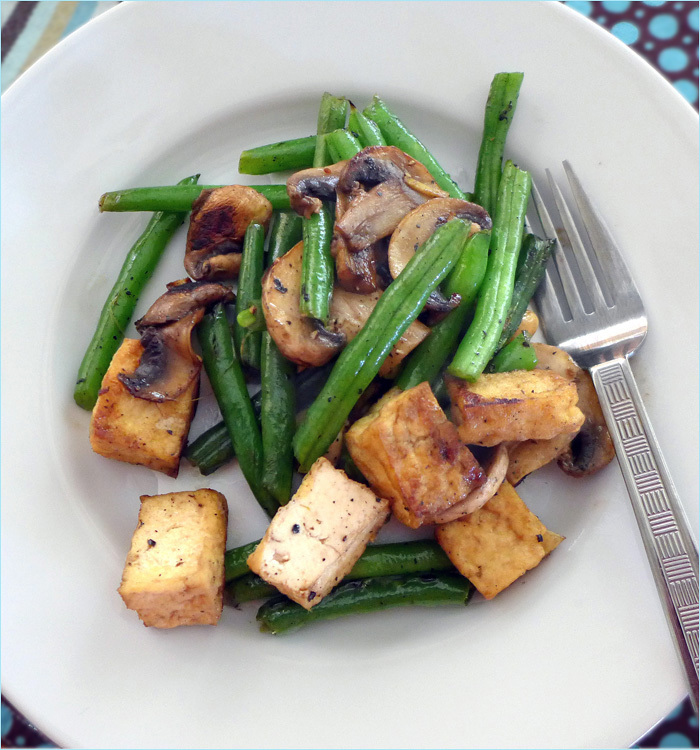 The tofu is Wildwood organic super-firm sprouted tofu — the firm texture is very easy to work with, and satisfyingly chewy. 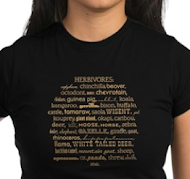 'Chewy' is a food group, you know. 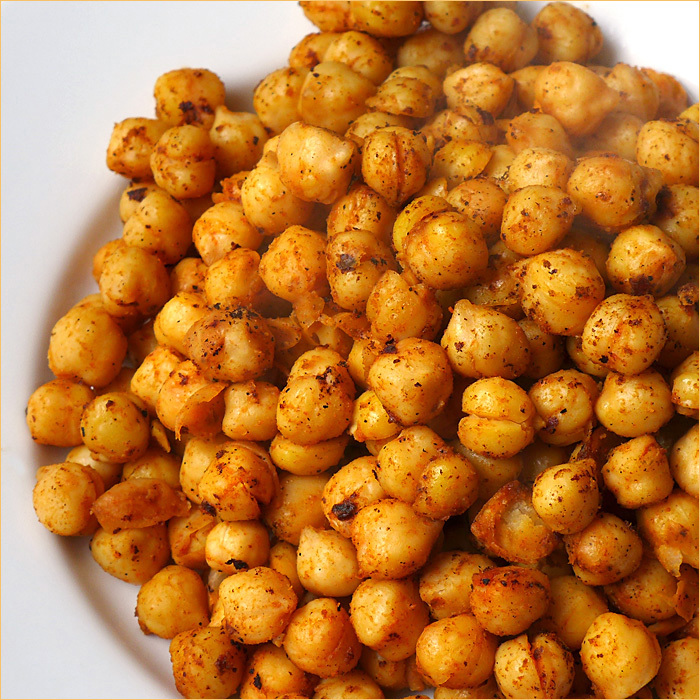 Roasting chickpeas or cooking them in a skillet or wok, for a snack or part of a meal, is so easy and delicious. 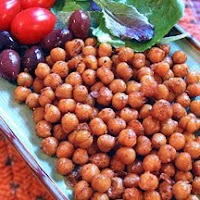 Click here for a basic recipe, but you can season the chickpeas with any of your favorite herbs and spices. I like smoked paprika and a grind of pink salt and pepper, but only you know what taste you are craving. 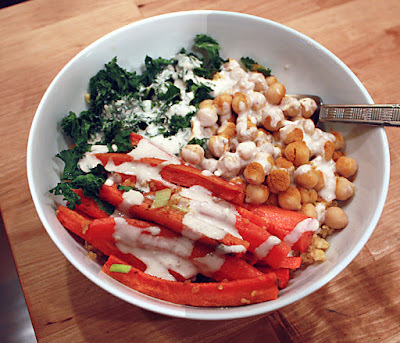 If you have leftover chickpeas, roast some carrots, cook quinoa or rice, steam kale, make a tahini sauce and enjoy a wonderful bowl. 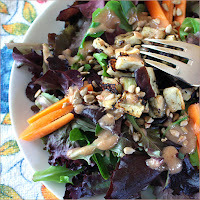 Click here for a link to a tahini umeboshi dressing. 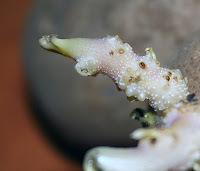 If umeboshi is too exotic, you can make tahini sauce with a couple tablespoons of tahini, a tablespoon of lemon juice, a little garlic, salt and pepper, and enough water to make a drizzleable sauce. 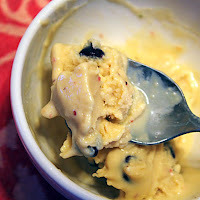 Mix all together with a fork until smooth and creamy. Adjust the ingredients to your taste. This is tempeh, obviously, but that's all I remember. My husband prepared it, and I don't remember what he used to flavor it. 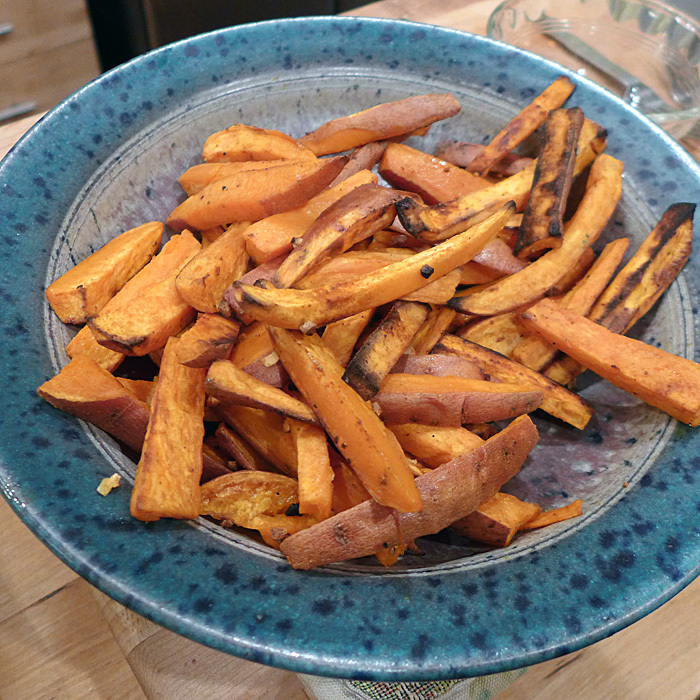 Last but not least, there's nothing like a giant plateful of beautiful, orange, sweet potato oven fries to perk up a meal. Cut them into 1/2 thick fingers and mix them with 2 to 3 finely minced cloves of garlic. (about 1 tablespoon) Spread them in a single layer on an oiled baking sheet, spray them with olive oil (or toss with a tablespoon of oil before spreading on the sheet). Bake in a pre-heated 475˚ oven for about 40 minutes or until soft but slightly crisp. Sprinkle lightly with sea salt and freshly ground pepper. And eat. Despite a long history of dessert ambivalence and fear of baking, I have somehow become the official family dessert maker. I usually make a cake, tart, pie or cookies for family dinners. Once, my little granddaughter told me I was 'probably' the best baker in the whole wide world. She has since retracted that statement but I still hold onto the memory of the honor — no matter how short-lived it may have been. With my reputation in mind, I was pondering what to make for dessert for the most recent family dinner at our house, when a recipe for nicer krispy squares from Dreena Burton's Plant Powered Families, popped up in my facebook feed. It had been ages since I'd made crispy treats and I thought they would be a welcome change from the usual baked item. 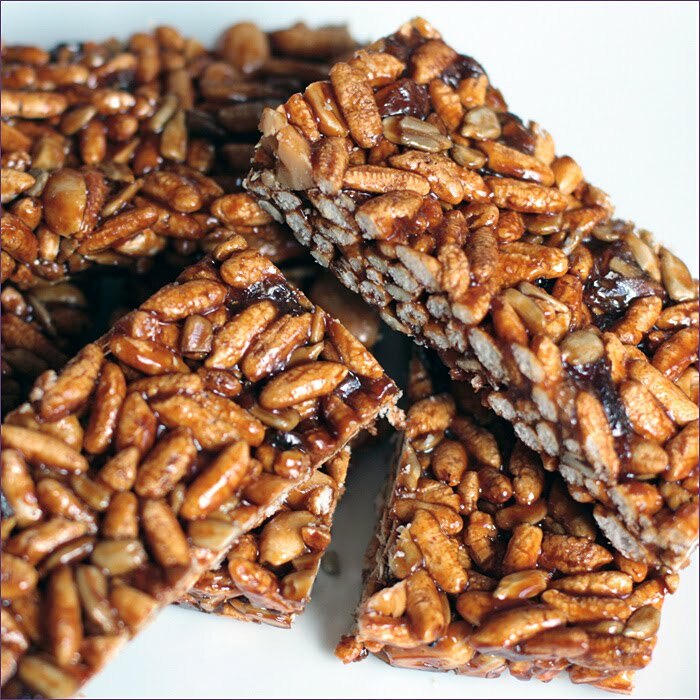 I first started making crispy cereal treats in the 80s for my kids to enjoy. Back then, I had to concoct my own recipe based on how I knew certain foods would behave and taste. 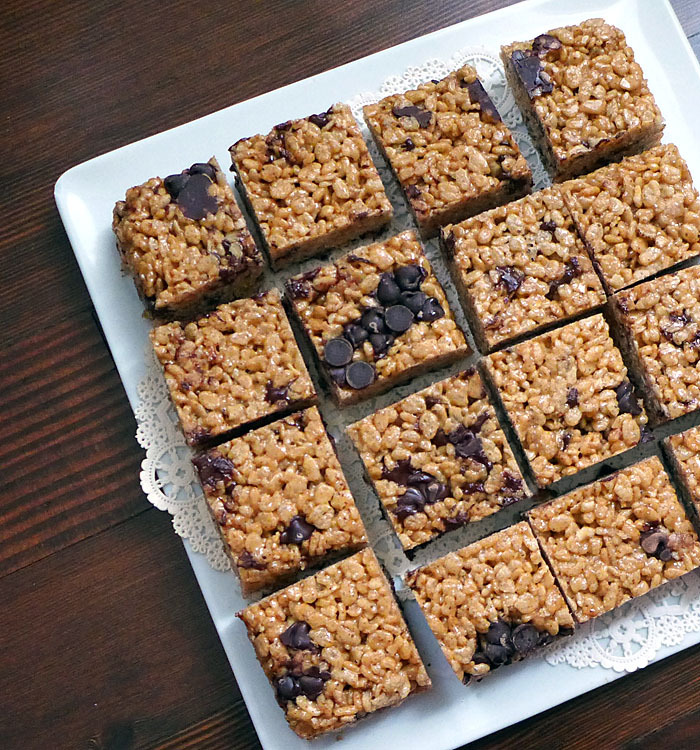 I called my recipe Andrea's crispy treats, for lack of a more clever title, and I made the bars often. 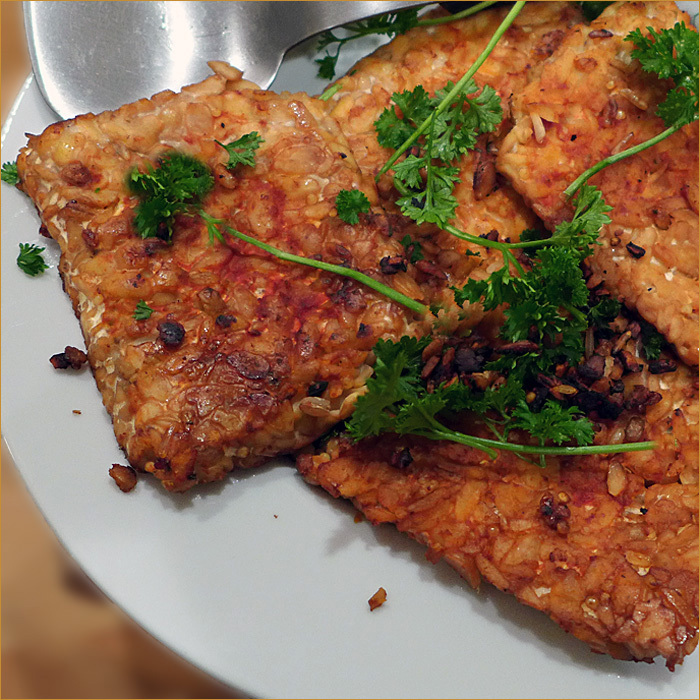 A few years later, after watching old video footage of a Chinese street vendor making puffed rice bars to sell to eager customers, I was inspired to enhance my recipe a bit. The grainy, black and white video, which I viewed in a Tai Chi class, wasn't in English, so I didn't know exactly what the vendor was adding to his mix, but as soon as I got home, I started experimenting to try to recreate what I had observed. 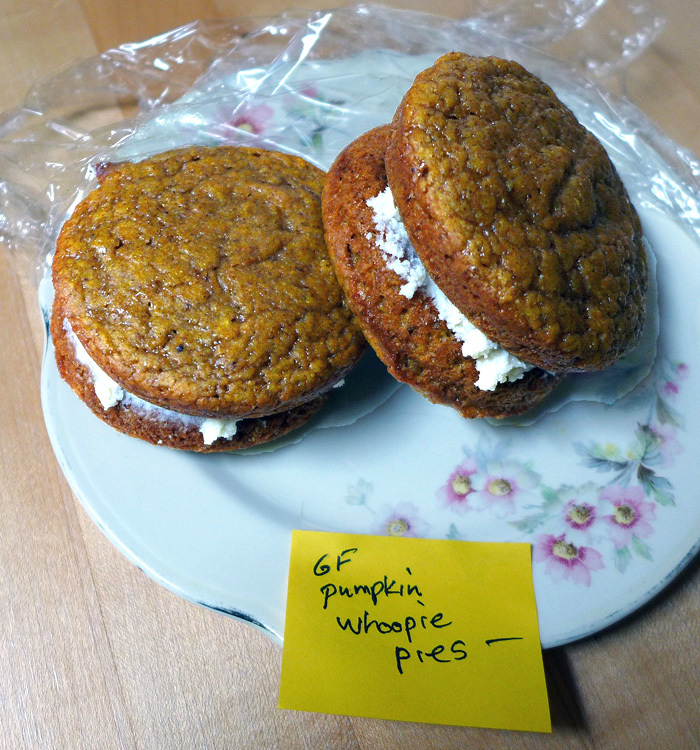 Everyone who tasted the bars asked for the recipe, and I would happily write it out and hand it over. There were no blogs back then, but I eventually posted the result of that experiment 25+ years later, in 2010, on this blog, and called it puffed rice bars. 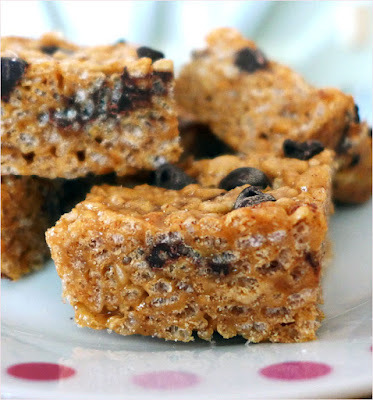 But those weren't the first cereal bars to appear on the blog. Back in 2007, I posted a recipe for chocolate crispy bars which was based on a recipe I found in Vegetarian Times the same year. One of the fun things about having been vegan for 35 years, is watching recipes recycle over time. 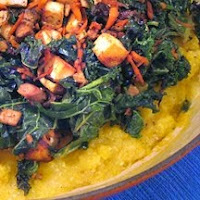 Sometimes I'll see a 'new' group of recipes that triggers a memory, and sends me back to my old vegan cookbooks to look for the originals. The number of vegan blogs, vegan cookbooks and vegan recipes available today is mind boggling, but it's always kind of cool to find the roots of a 'new' recipe in one of my old cookbooks or hand written files. Here are three crispy rice treat recipes to enjoy, whether you are just beginning your vegan journey, or have been following a kind diet for a long time. Oil a 9×9-in pan and line the bottom with parchment paper. It helps to have the paper go across the bottom and up two sides. combine cashew butter, almond butter, syrup, sugar, and salt in a large saucepan on low-medium heat. Stir continually as mixture heats until the nut butters are melted. Don't let it boil. Working quickly, add cereal, mixing carefully with a wooden spoon to fully incorporate with the syrup mixture. Transfer half of mixture to pan and press in firmly and evenly, using a piece of parchment paper to avoid sticking. Sprinkle half of the chocolate chips over the surface and press firmly into the mix. Spread the remaining cereal mixture over the top and press down firmly and evenly. Sprinkle the remaining chocolate chips over the top and press into the bars. Don't despair at the hardened coating on the pot. Soak it in hot water and it will come right off. 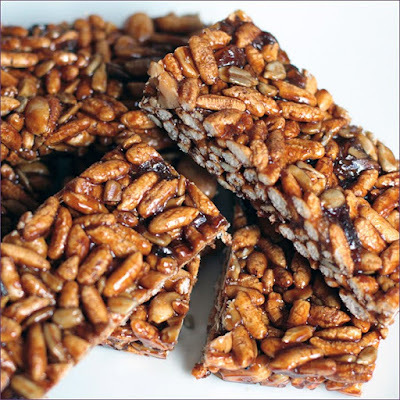 This is the recipe I put together 25 years ago after watching an old film of a Chinese street vendor making amazing-looking puffed cereal bars on his cart. In a 425˚ oven, toast the cereal in a large pan for 8 minutes, stirring once or twice. This isn't essential but it intensifies the flavor. Toast the sunflower seeds in a heavy pan on the stove until fragrant and golden. In a large bowl, combine the cereal, sunflower seeds, raisins and peanuts, and mix well, distributing the ingredients evenly. It helps to use your hands. Heat the syrup in a 1-1/2 quart pot over low-medium heat, stirring constantly. The syrup will start to bubble and foam. Adjust the heat if necessary so the syrup doesn't overflow. Cook and stir for 7 minutes, then add the peanut butter and stir until completely melted, about a minute more. Pour the hot syrup mixture over the cereal mixture, using a silicone spatula to quickly get it all out of the pot. 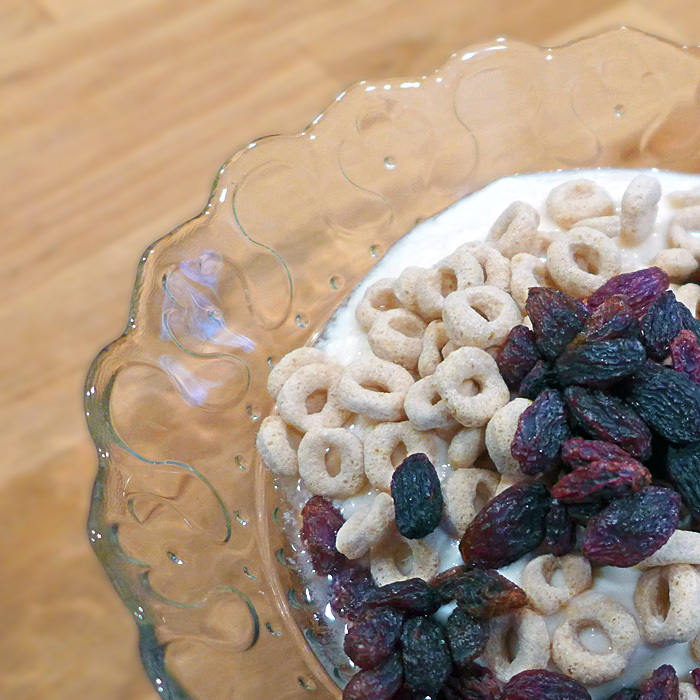 Quickly and thoroughly combine with a wooden spoon until all the cereal mix is completely coated. 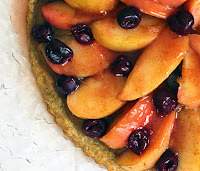 Press into a lightly oiled and parchment paper-lined 10-1/2 x 15-1/2 inch pan, using the spoon, or pressing down with a small piece of parchment paper. The mixture will cool quickly. 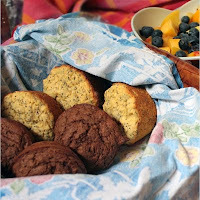 Using the parchment paper, press it down into the pan, making it even and compact. Cool in the refrigerator for 15 minutes, then cut into pieces with a serrated knife or a pizza cutter. For best results store in the freezer or refrigerator. The bars soften at room temperature. I cut mine into 24 rectangles. Oil and line a 9x9 baking dish with parchment paper. Remove from heat, stir in vanilla then stir in as much of the cereal as the syrup will absorb without becoming too dry. Work quickly and mix thoroughly. Press into the dish. 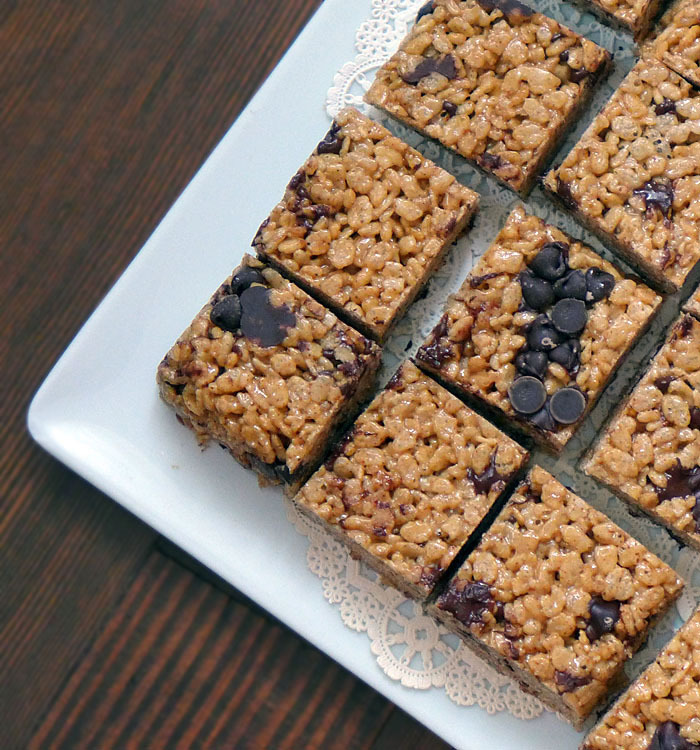 You can use a piece of parchment paper to help press the bars down. Cool in the refrigerator 15 minutes then slice into pieces with a knife dipped in cold water. Refrigerate to harden. Back in the olden days, early to mid 70s, when I was vegetarian and not vegan, I used to make my own yogurt. I had a square ceramic hotplate-type yogurt maker with four square eight-ounce glass jars. 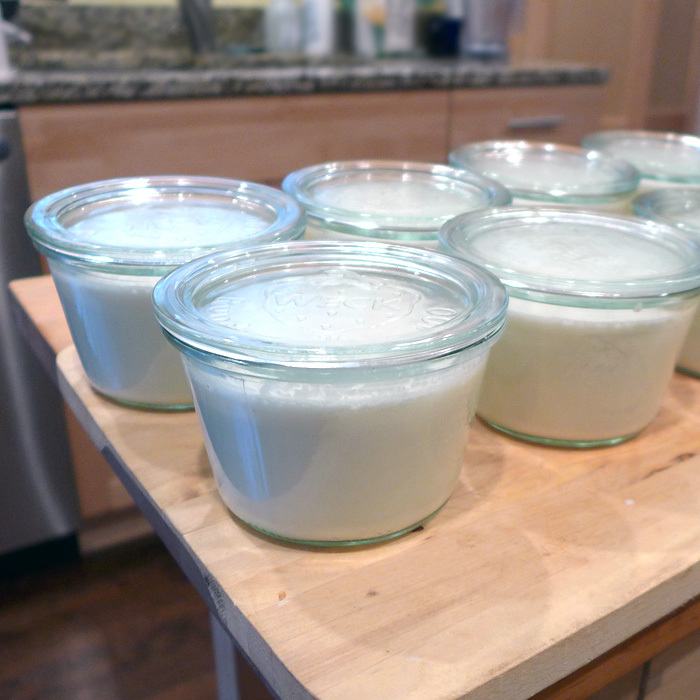 I'd throw a towel over the filled jars, and the base would keep them at the perfect temperature for incubating yogurt. At some point I stopped making my own yogurt — probably because decent commercial yogurts were available, and I lost interest in doing it myself. When I became vegan in 1981, there wasn't much to choose from in non-dairy yogurt. I sometimes bought soy yogurt for my kids from a soy co-op that mainly sold tofu, but although the boys loved it, I couldn't stand the stuff. There have been a few brands I liked since then, that have come and gone (like Whole Soy) over the years, but unless I needed yogurt for a recipe, I just didn't buy it. With the demise of Whole Soy, I could no longer find a brand I liked. I'm talking about plain, unsweetened yogurt. Almost a year ago, I really wanted yogurt, and started sampling commercial brands, but they all tasted unpleasant to me. And I hated all the additives. The time had come to make yogurt again. I wanted to make a pure and simple almond milk yogurt. Yeah, right. I'd been at it about a month — not being very successful at getting the yogurt to thicken — when I saw a post on Vegan Eats and Treats on making soy yogurt. My first reaction was "Dang. Every time I think I have a post in the making, someone beats me to it." But my second reaction was, "OK. What's the secret? Maybe I can learn something here." She was following a recipe from Artisan Vegan Cheese by Miyoko Schinner, that included adding cashews to her soymilk. I added cashews to my almond milk. Nope. All I could get was a kefir-like consistency that tasted like yogurt. It worked great in smoothies but wasn't ideal for eating with a spoon. I was about to start adding ground chia to my almond milk but all I had was black seeds and didn't want to chance creating grey yogurt. While waiting to find white chia seeds I got distracted from my goal and bought a half gallon of soy milk, and I've been making soy yogurt ever since. One of these days I'll try again to make almond milk yogurt, but for now, it's soy. The last batch was exactly the way I wanted it to be, so I think it's time to post about it. It's pretty obvious why everyone else gets their posts up before me. But there must be someone out there who hasn't tried making yogurt, so better late than never. At first I used organic, unsweetened 365 (Whole Foods) brand soy milk. Lately, I've been using Silk organic unsweetened soy milk. The Silk contains "natural flavors" which give it a slight vanilla taste. At first I thought it was nice, but a little too sweet. Then I realized that the cashews also add a sweet taste, so I've reduced the amount of cashews to achieve a taste I consider perfect for both sweet or savory applications. For the cost of 1/2 gallon of soy milk plus 1/2 cup of cashews, I get a little more than eight cups of yogurt. I use about six tablespoons of the previous batch of yogurt to make the next batch. (For the first batch, I used Nancy's plain soy yogurt.) I use Weck canning jars, which I found at Crate and Barrel, in a 10-ounce size, which is perfect for holding 8-ounces without spilling. They come with rubber sealing rings and clips but I use them without the sealers — the lid sets into the top of the jar. They stack perfectly in the refrigerator, and they nest when empty for convenient storage. Some people like to use quart jars but I prefer serving-sized jars. 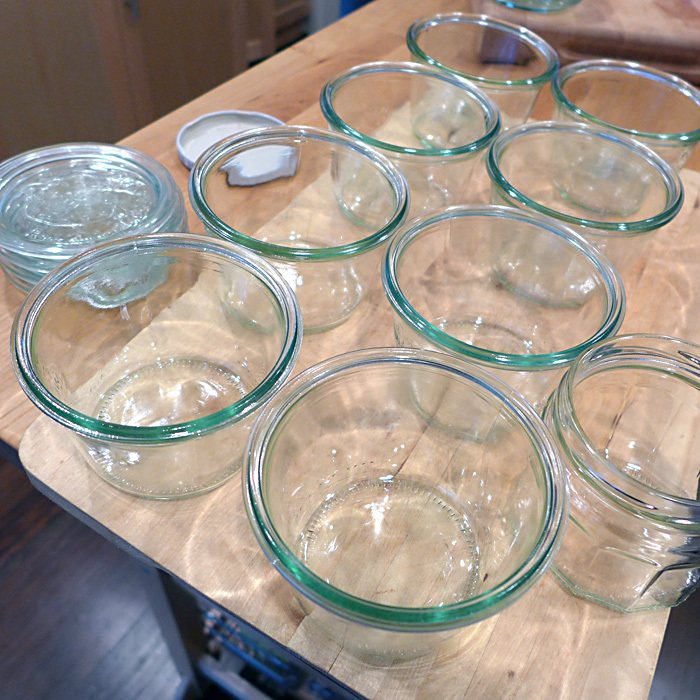 Any glass jar will do — whatever you have. Just make sure they are clean. You can even make your yogurt in the pot you heat the milk in, and spoon it into jars after it's thick, but I do what's easiest for me. Here's a video of Miyoko demonstrating how to make yogurt. Before starting, I warm the oven to the lowest setting (170˚ F on my oven) then immediately turn it off. (The correct temperature for incubating yogurt is 110˚ F, so I let some of the heat out before the jars go in.) I arrange the jars on an old cutting board so they are ready to fill and easy to manage. The ingredient proportions I use are 1/2 gallon of soymilk and 1/2 cup of soaked ( four to six hours) and drained cashews. First, put the soaked cashews and about two cups of soy milk into a high speed blender, and blend until the mixture is perfectly smooth. (Don't wash the blender yet!) 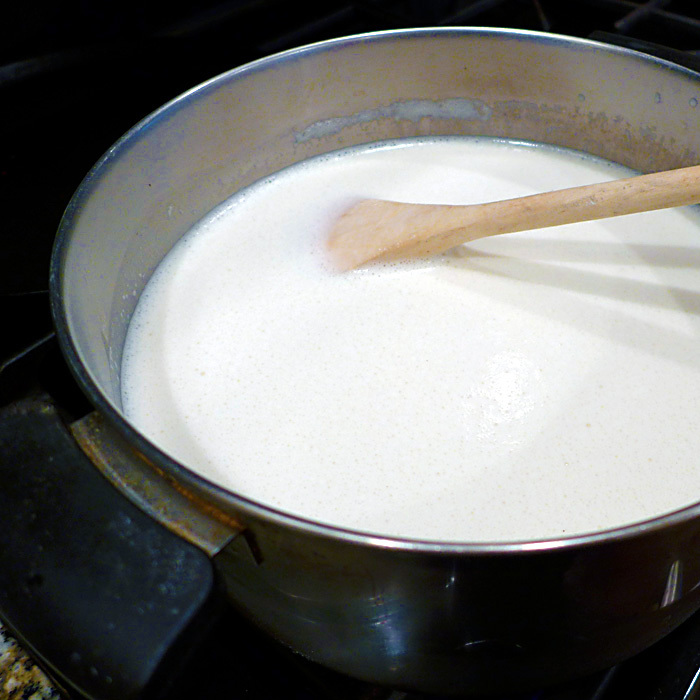 Then add the blended milk and the rest of the soy milk from the carton to a large pot, such as a four-quart Dutch oven. Heat gently and stir the milk until it feels warm when dripped onto your wrist. (If you have a thermometer, the milk should be at 110˚ F.) Add four to six tablespoons of unsweetened yogurt to the pot and whisk it in. Pour the soy milk back into the blender (only about half will fit at a time) and use the blender as a pitcher to fill the jars. *Although, as I mentioned, it's hard to ruin the yogurt, it can be done, and mine has been ruined three times. Once was a total loss, and the other two times the yogurt was still usable. My husband has twice turned the oven on to preheat it for another purpose without noticing the light was on and the yogurt was inside. One of those times the yogurt was pretty much separated into curds and whey from the high heat, but was still edible after being stirred, but I guess the beneficial bacteria were long gone. The second time he turned on the oven, my husband tried to pull the cutting board out but underestimated the number and weight of the jars, and the temperature, and he dropped the board, spewing yogurt all over the oven and floor, and cracking two of the jars. That was not a happy scene. The third time, I whisked the yogurt into the pot, then walked away for a few minutes. When I returned, the soy milk had started to thicken, and was all lumpy, so I unfortunately decided to put it into the blender and start over. Don't do this. The milk foamed up and doubled in quantity. I stirred it but couldn't get rid of the foam, and had to scramble to find jars to hold the increased volume. The foam just wouldn't go down and I didn't want to throw it all away. The resulting yogurt was odd, with a foam-yogurt top. I stirred it before eating, and it had an almost chiffon-like texture while still tasting like yogurt. It wasn't horrible, but I wouldn't do it on purpose! Actually, there was a fourth upset. I almost forgot about the almond milk yogurt I tried to 'enhance' and thicken with hemp seeds. 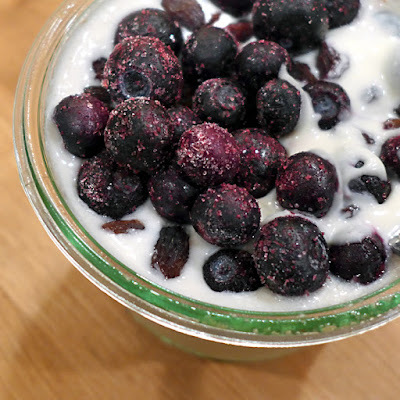 I like hemp seeds, and add them to my smoothies, but I must have added too much to the yogurt mix because the resulting yogurt was so horrible tasting I had to throw it away. Believe me, I tried hard to eat it, but it was impossible. Fortunately, at that point, I was only making a quart at a time. Making yogurt is so easy and economical. 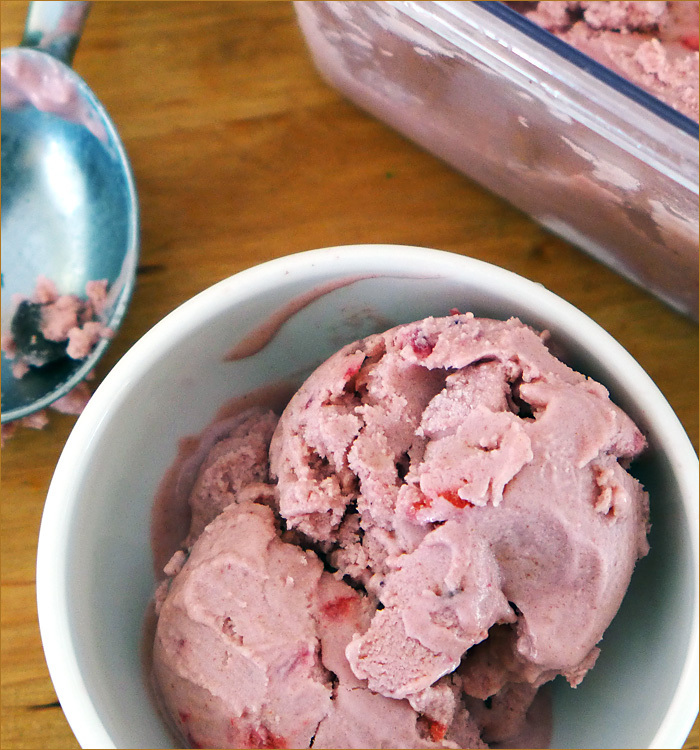 My latest batch is amazingly creamy and delicious — better than any of the commercial yogurts I've tried. Do you make yogurt? Have you had success with almond milk yogurt? 1. I'm no longer recommending the Weck 10 oz. jars. Several of them have cracked along the bottom edge, and have to be replaced. I hand wash them, and they aren't subjected to high heat so I'm not sure what the problem is. I may write to the company to see what they say. 2. Instead of the cutting board, I place a folded kitchen towel on a metal baking pan. 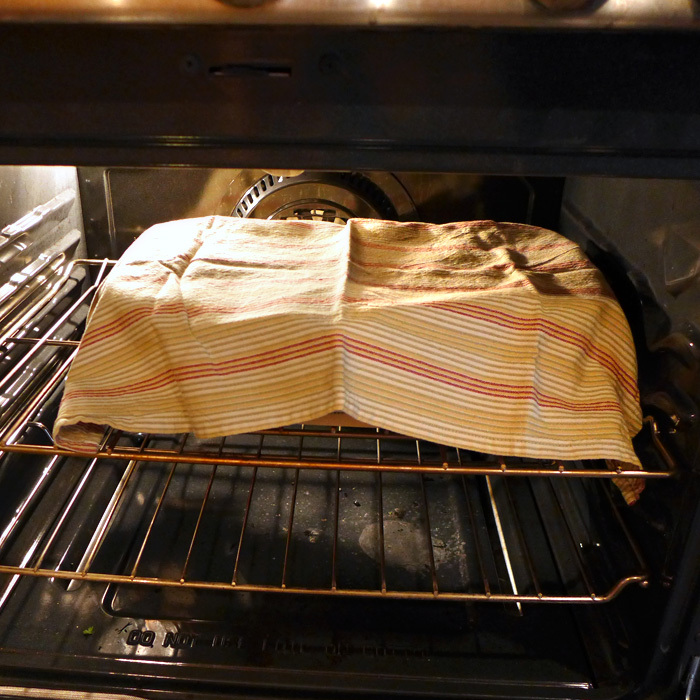 The towel prevents the jars from moving, and maybe the metal retains some heat from the oven. The pan has a one-inch edge which makes lifting the jars out of the oven less precarious. 3. I add two or three dates to the cashews and milk before blending. It gives the yogurt a nice flavor. 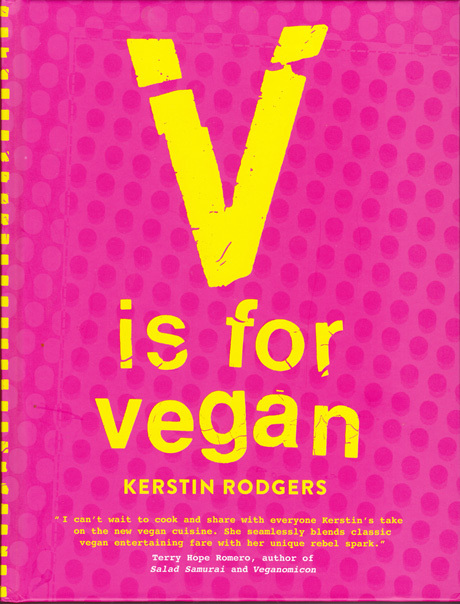 V is for Vegan by Kerstin Rodgers, first published in 2015 in London by Quadrille Publishing Limited, is available in the U.S. as of March 1, 2016. 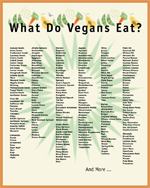 It's filled with a collection of exotic and exciting international vegan recipes that range from easy to complex. The introduction provides a clear description of what vegans do and don't eat, and a brief history of veganism. The next 27 pages form a section called "Knowledge is Power," where you can find ingredient descriptions, and instructions for making many of the unusual "flavor-booster" ingredients that are required in various recipes. 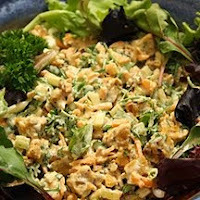 For example, there are recipes for vegan parmesan, preserved lemons, pink pickled onions, pickled green grapes, macadamia dukkah, baechu kimchi, candied zucchini strips, etc., plus directions for making staples like tofu, stock, cheese and nut milks. You can go to Amazon.com to 'look inside the book' to survey the chapter if you want to get a real taste for the breadth of information it contains. The recipes are alluring, but maybe not for everyone. You probably wouldn't come home on a weekday and attempt to throw together one of the dinner recipes. Chances are great you will first have to hunt down ingredients, perhaps marinate or blend something ahead of time, plus you'll need to give yourself plenty of time to prep and cook the actual dish. Not everyone wants to open a coconut to make soup or curry, even if it's more authentic than opening a can of coconut milk. And a few of the recipes that I picked out to make based on their title or photo, contained ingredients I've never heard of. What, for example, is a glug of verjuice? 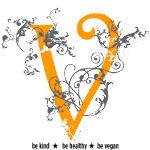 On the other hand, if you're looking for a selection of recipes for special occasions, you will find plenty to choose from in V is for Vegan. Chocolate Sichuan Pepper Fettuccine with Porcini & Black Olives, Three-Topping Polenta Party and Pizzette with Roast Pumpkin, Red Onion, & Sage beckon. 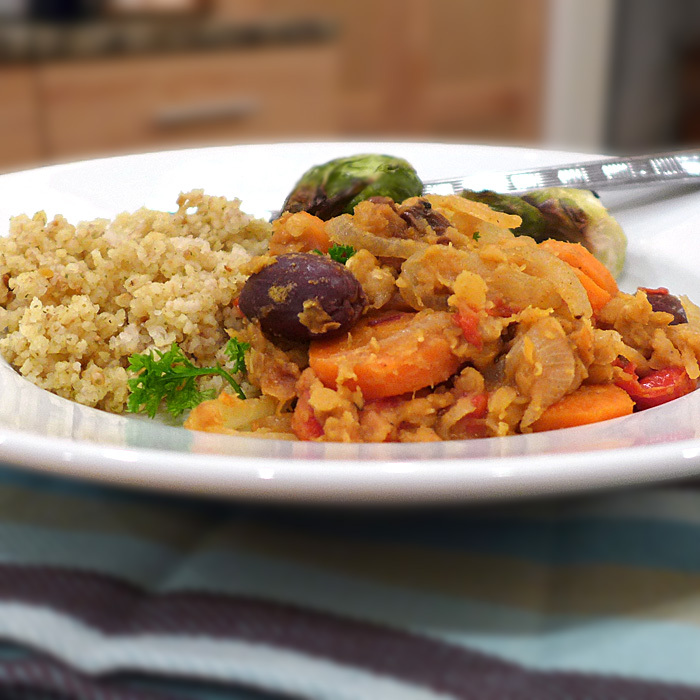 Because my blog (and I) specialize in easier to prepare dishes, I tried to pick one of the more straightforward recipes to try, and selected Moroccan Carrot, Pepper, & Lentil Tagine. Even in this recipe there were unusual ingredients like ras el hanout and orange flower water, which we don't usually have on hand. I found recipes for ras el hanout on the Internet, and chose one that contained 14 ingredients, all of which I had in my spice drawer. I also found a hack for the orange flower water. My husband made the dish, and he was in the kitchen for a long, long time, prepping and cooking. The finished dish was good, but not as fabulous as I was expecting, considering the amount of effort that went into preparing it. The next recipes I have picked out to try are Eggplant Baked With Miso Glaze, and Hibiscus Flowers in Blue Corn Enchiladas with Pickled Purple Cabbage. Don't they sound good? The eggplant recipe is Japanese, and fairly simple, while the enchiladas look a bit more complex. I just have to find dried hibiscus flowers! I think my favorite section of the book may be the snack section. 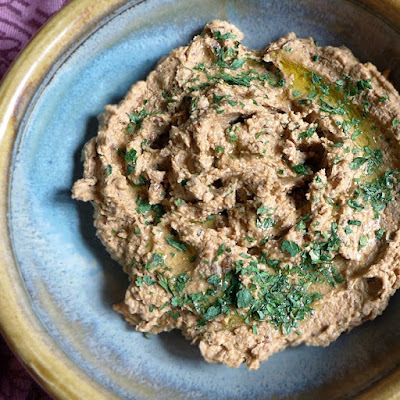 There are quite a few possibilities here, and one that caught my eye was Ful Medames Dip. 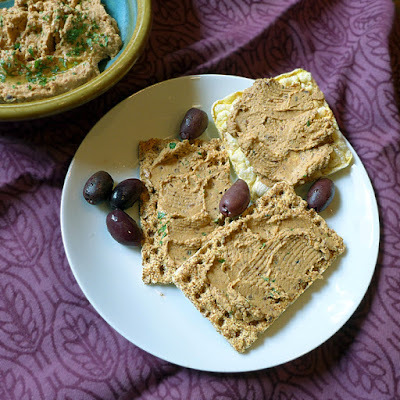 I think I was attracted to the recipe because of a ful medames I enjoyed many years ago in a wonderful Middle Eastern restaurant in Toledo, Ohio. I always intended to recreate it but never did. The original dish was made with whole fava beans, and was not a dip, but the dip recipe was perfect. 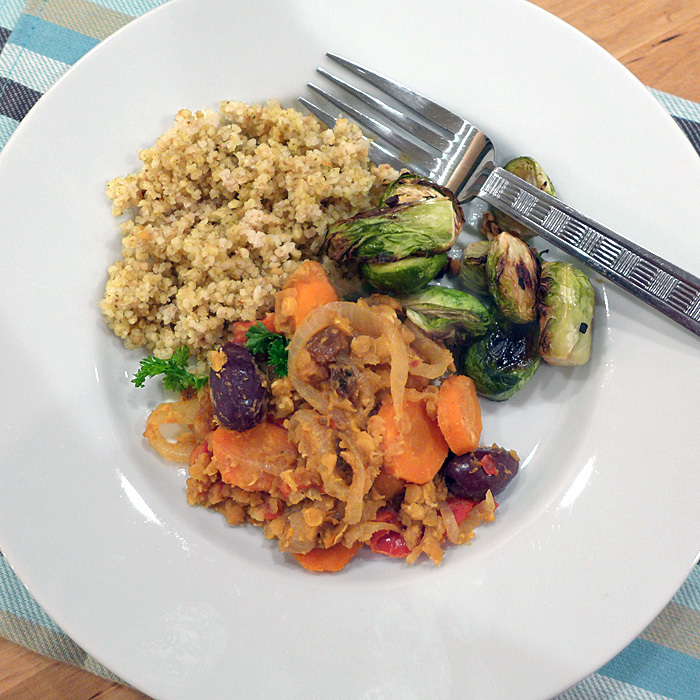 The recipe was easy to follow and the results were excellent — every bit as delicious as the one I remember. I liked the recipe for ful medames so much I requested permission to share it with you, and it appears after the review. 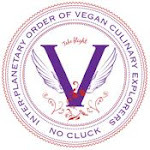 I think V is for Vegan would be best suited to adventurous cooks, both beginners and experienced, looking to explore, and learn to use, uncommon ingredients to create gourmet international dishes. 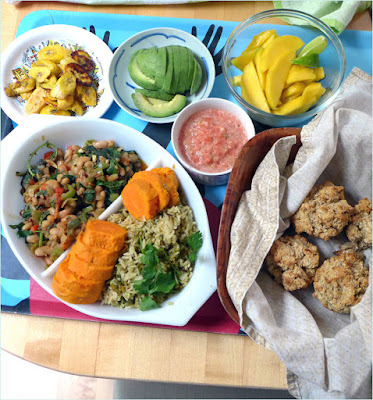 There are simple recipes to be found, but the emphasis is on more exotic, colorful fare, and chances are good you will find yourself looking for unfamiliar ingredients. A problem I encountered with the book was the somewhat difficult to read type — especially the fractional ingredient quantities, and notes at the beginning of recipes. The darker colors used as backgrounds on so many of the pages add to the reduced legibility. Also, some of the directions are a bit confusing and, in my experience, the cooking times can vary quite a bit from the the times given in the recipes. 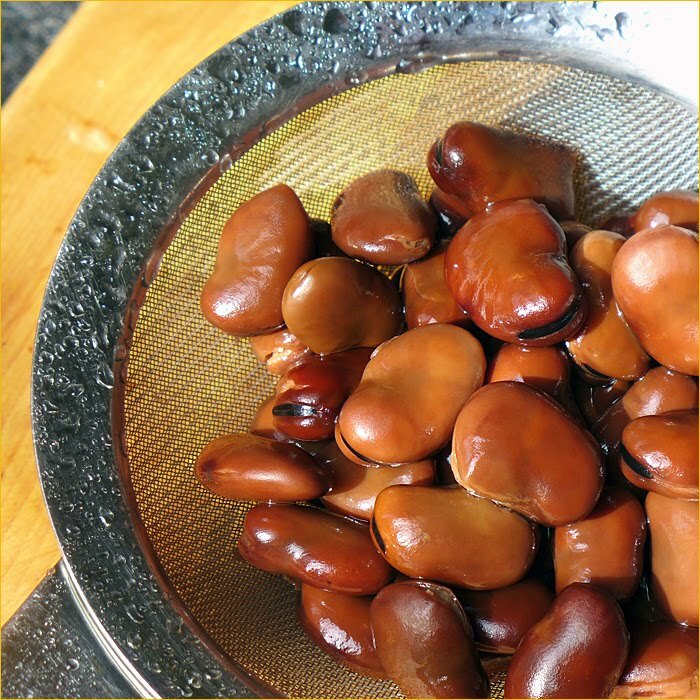 “Ful” are dried fava beans, a legume made infamous by Hannibal the Cannibal. You can make this Egyptian dip with fresh or frozen fava beans too. Think of it as a funkier, sludgier hummus. If using dried beans, boil them in water for 30 to 40 minutes (no need to pre-soak), then drain. Otherwise, drain the can. Add the beans, tahini, oil, lemon juice, garlic, paprika, and some salt to a food processor. Whizz to combine (or mash everything by hand). Transfer to a bowl, drizzle over more olive oil, and sprinkle with parsley. 1. I used a can of organic, low salt fava beans, rinsed and drained. If you decide to cook dried beans, I suggest looking up recipes. I had originally planned to cook the beans and when I searched instructions, most of the recipes I consulted suggested soaking the beans — some for two days! 2. 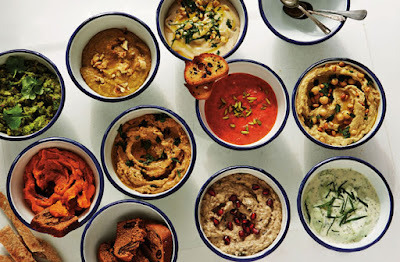 I use oil in cooking, but don't like to add it to dips that contain other high fat ingredients like tahini. I added one tablespoon of oil and one tablespoon of water instead of two tablespoons of oil, and drizzled about a teaspoon over the top of the finished dip, but I think you could omit the oil if you wanted to. 3. Out of sheer laziness I used dried parsley instead of going out in the rain to pick fresh. It wasn't bad, but I recommend fresh. Kerstin Rogers is a chef, author, food and travel writer. 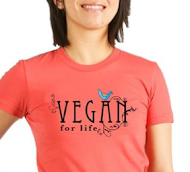 V is for Vegan is her third book. She writes a blog called MsMarmiteLover where she shares her recipes and food knowledge. 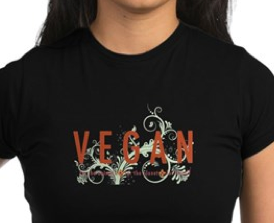 I have to warn you that the blog is not a vegan blog, but there is much to learn there. V is for Vegan was sent to me without cost, for review. I didn't get paid to write the review and all opinions are my own. The post contains Amazon links. A selection of dips from V is for Vegan. Photo by Jan Baldwin, 2015. Quadrille Publishing Limited.